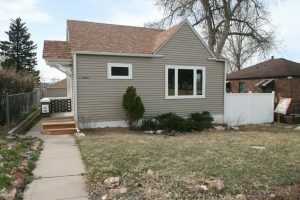 1809 Cheyenne Place in Cheyenne WY is live on the market! This charming house is just East of Logan. 1809 Cheyenne Place is officially on the market! Don’t wait because this completely remodeled home priced at $259,000 will sell fast in our busy real estate market! Occasionally remodeled homes aren’t done with the proper permits and inspections, but don’t worry this one has been handled with care and all of the right permits and inspections! You’ll find new windows, a new roof and a beautiful, well thought out kitchen with new appliances! You’ll have plenty of room to enjoy your living space, then four bedrooms for everyone to have his or her own bedroom, plus 2 bathrooms! The home feels and smells clean with its new paint, hardwood floors and carpet! All of the plumbing, water heater, and electrical are new. This home has steel siding, so you won’t have to paint every year. You’ll have a one car garage with alley access. This home is close to Lincolnway, so you’ll have easy access to restaurants, Walgreens and Albertsons or Walmart for your shopping. Check out the full listing details here! Contact Kevin True or Adri True for more information!